This assay has high sensitivity and excellent specificity for detection of ADCY10. No significant cross-reactivity or interference between ADCY10 and analogues was observed. MBS456935 is a ready-to-use microwell, strip plate ELISA (enzyme-linked immunosorbent assay) Kit for analyzing the presence of the Adenylate Cyclase 10, Soluble (ADCY10) ELISA Kit target analytes in biological samples. The concentration gradients of the kit standards or positive controls render a theoretical kit detection range in biological research samples containing ADCY10. The ELISA analytical biochemical technique of the MBS456935 kit is based on ADCY10 antibody-ADCY10 antigen interactions (immunosorbency) and an HRP colorimetric detection system to detect ADCY10 antigen targets in samples. The ELISA Kit is designed to detect native, not recombinant, ADCY10. Appropriate sample types may include undiluted body fluids and/or tissue homogenates, secretions. Quality control assays assessing reproducibility identified the intra-assay CV (%) and inter-assay CV(%). Intended Uses: The kit is a sandwich enzyme immunoassay for the in vitro quantitative measurement of ADCY10 in human tissue homogenates or other biological fluids. Principle of the Assay: The microtiter plate provided in this kit has been pre-coated with an antibody specific to ADCY10. Standards or samples are then added to the appropriate microtiter plate wells with a biotin-conjugated antibody preparation specific to ADCY10. Next, Avidin conjugated to Horseradish Peroxidase (HRP) is added to each microplate well and incubated. After TMB substrate solution is added, only those wells that contain ADCY10, biotin-conjugated antibody and enzyme-conjugated Avidin will exhibit a change in color. The enzyme-substrate reaction is terminated by the addition of sulphuric acid solution and the color change is measured spectrophotometrically at a wavelength of 450nm +/- 10nm. 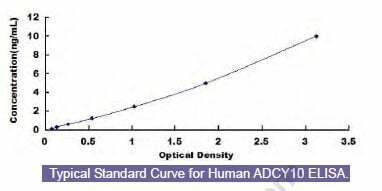 The concentration of ADCY10 in the samples is then determined by comparing the O.D. of the samples to the standard curve. Catalyzes the formation of the signaling molecule cAMP (PubMed:12609998, PubMed:15659711, PubMed:24616449, PubMed:25040695, PubMed:24567411). May function as sensor that mediates responses to changes in cellular bicarbonate and CO2 levels (PubMed:15659711, PubMed:17591988). Has a critical role in mammalian spermatogenesis by producing the cAMP which regulates cAMP-responsive nuclear factors indispensable for sperm maturation in the epididymis. Induces capacitation, the maturational process that sperm undergo prior to fertilization (). Involved in ciliary beat regulation (PubMed:17591988). 1. results thus provide 1) novel insights into the communication between allosteric regulatory and active sites, 2) a novel mechanism for sAC inhibition, and 3) pharmacological compounds targeting this allosteric site and utilizing this mode of inhibition.